We’re here to help you achieve your financial goals, manage your money and ultimately, better your life. Unlike many other investment firms that use a cookie-cutter financial plan for all their investors, we apply our Purpose-Based Asset Management approach. By creating separate compartments for each investor's multiple purposes, we create a structure that allows for a prudent, less emotional investment decision-making process. We believe that markets are efficient and investment returns are determined by asset allocation and the passage of time, not by manager selection or market timing. Our client's portfolios are constructed using efficient, low cost investment vehicles such as Vanguard ETFs and Dimensional Funds (DFA). We are focused on your security and work tirelessly toward one goal: help you achieve financial peace of mind. As a boutique money management firm, we offer you a service that is personal, private and exclusive. We know you can go many places for financial advice, but the clients of Disciplined Advisors Group benefit from the more than five decades of investment experience. As an independent advisory group, our advice is not influenced by a corporate parent and we are free to choose the right solutions for you. At Disciplined Advisors Group – trust, commitment and caring make up the foundation that provides services to our clients. 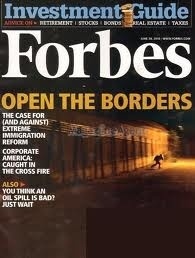 Click picture below to view Forbes Magazine profile of DAG. Disciplined Advisors Group operates under First Financial Equity Corporation (FFEC). Securities and Registered Investment Advisory Services offered through First Financial Equity Corporation. Member FINRA/SIPC. You may obtain additional information from FFEC by going to website www.ffec.com. Should you have any questions you may directly contact your investment representative at 480-951-0079, Fax to 480-998-2883 or call our toll free number at 888-951-1010. An official copy of statements can be obtained by contacting the custodian of assets directly.